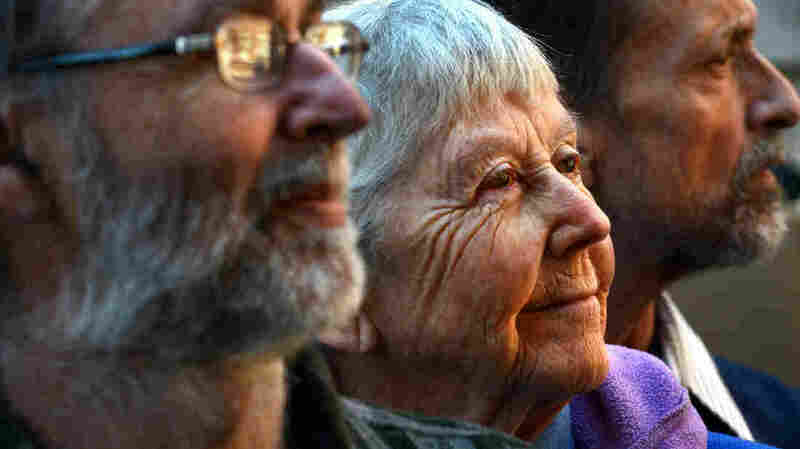 Nun Who Broke Into Nuclear Complex Gets 35-Month Jail Term : The Two-Way In 2012, Sister Megan Rice, 84, and two other activists broke into Tennessee's Y-12 National Security Complex, where bomb-grade uranium is stored. Rice had asked the judge to show her "no leniency." "An 84-year-old Catholic nun was sentenced Tuesday to nearly three years in prison for breaking into a nuclear weapons complex and defacing a bunker holding bomb-grade uranium, a demonstration that exposed serious security flaws at the Tennessee plant," The Associated Press writes from Knoxville, Tenn.
"Please have no leniency on me," Rice told the judge. "To remain in prison for the rest of my life would be the greatest honor you could give me." Sentencing guidelines called for a prison term of about six years. The AP reports that while U.S. District Judge Amul Thapar "said he was concerned the demonstrators showed no remorse and [that he] wanted their punishment to be a deterrent for other activists .... he was also openly skeptical about whether the protesters caused any real harm." Signs warn against trespassing on to the Y-12 National Security Complex in Oak Ridge, Tenn.
Two other people convicted along with her received longer sentences. "Activists Michael Walli, 64, and Greg Boertje-Obed, 58," the Tennessean adds, were each sentenced to five years and two months in prison. Their prison terms are longer than Rice's because of their previous acts of civil disobedience. The three were also ordered to collectively pay nearly $53,000 in restitution for the damage they caused to U.S. government property. 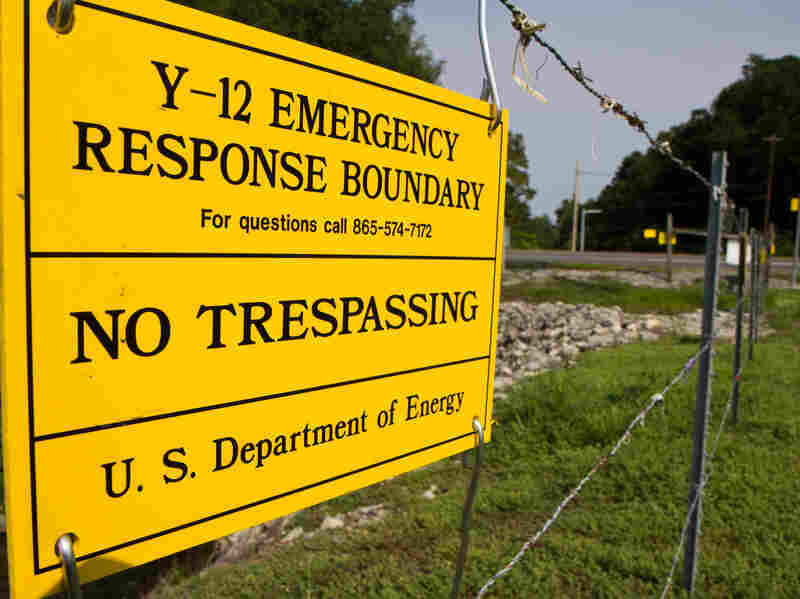 "On July 28, 2012, the three activists cut through three fences before reaching a $548 million storage bunker" at the Y-12 National Security Complex in Oak Ridge. "They hung banners, strung crime-scene tape and hammered off a small chunk of the fortress-like Highly Enriched Uranium Materials Facility, or HEUMF, inside the most secure part of complex. After the break-in, the complex had to be shut down, security forces were re-trained and contractors were replaced." The activists wanted to call attention to the money the U.S. government spends on weapons and the military, which they argue is far more than necessary. While in the facility, the AP writes, "they painted messages such as, 'The fruit of justice is peace,' and splashed baby bottles of human blood on the bunker wall. 'The reason for the baby bottles was to represent that the blood of children is spilled by these weapons,' Boertje-Obed, a house painter from Duluth, Minn., said at trial." Matt Shafer Powell of NPR member station WUOT previously reported for All Things Considered that the facility is "often described as the Fort Knox of nuclear weapons material. So no one was more surprised to find out that an 82-year-old nun could break into the complex than the woman who did it." "We had no idea how much was electrocuted," Rice told WUOT. "The sensor, we didn't know exactly which was, we suspected which was but we kept moving. No dogs came out. We had heard dogs earlier on." As Matt added on Tuesday, "in a 2013 interview with WUOT News, Rice was nonchalant about the idea that she could die in prison. 'It's six of one and half-dozen of the other, whether we go to jail, whether we stay out,' she said. 'Either way is fine.' "